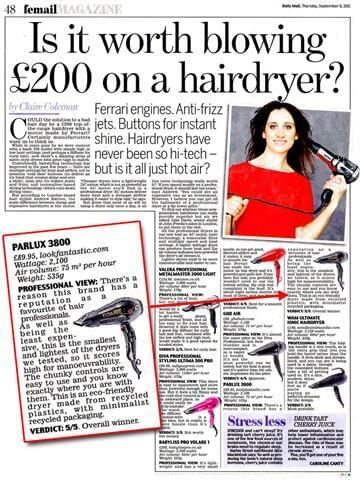 The column “Femail” published on Sept. 6th, in the well-known British newspaper Daily Mail, highlighted the reliability and the new up-dated technology used in the production of hairdryers, especially “professional ones”, as an important and indispensable tool for hair beauty in the female world. Six different models made by the better-known international producers have been chosen after consultation with Andrew Barton (multi-winner of many hairdressing awards) and Jake Davis (Senior hairstylist at the John Frieda Salon in London). On the many different important characteristics of each dryer, they decided to give a score out of a total of five to each dryer. Parlux 3800 Eco Friendly won the first position with a score of 5/5! In fact, the powerful motor AC, present in many professional hairdryers, such as in the recent Parlux models, assures very quick drying; this motor together with the ideal measure, light-weight, ergonomic shape and incorporated silencer and negative ions device as in the Parlux 3800 Eco Friendly model, makes it “probably the best professional hairdryer in the world” as the Italian Company slogan states. This “made in Italy” hairdryers manufactured using recycled raw materials and “minimalist packaging” (with recyclable paper) are very appreciated features by Parlux users. The Parlux sensitivity towards ecology topics and environmental protection makes this Italian Company and its Parlux 3800 Eco Friendly hairdryer much loved by all professionals who wish to work with the best hair-drying tool.